We’ve had a lot of fun this past week, teasing Ben Affleck for all the negative reviews of Batman V Superman: Dawn Of Justice. (Including ours.) And sure, it was a treat imagining the actor being very sad about the subpar movie of which he was an integral part. But there’s no reason for Affleck to be too down on himself. Not only does it seem to be generally agreed he was one of the better parts of the film (something he should be doubly happy about, if the rumors he rewrote his own dialogue are to be believed), but he’s also an internationally acclaimed, Oscar-winning director and iconic movie star, which probably buys a lot of fucks he can then proceed to not give. But he’ll do us all one better. If you didn’t like this one, fine—Ben Affleck’s written his own damn Batman movie. To paraphrase his Academy Award-winning script, how do you like them Bat-apples? 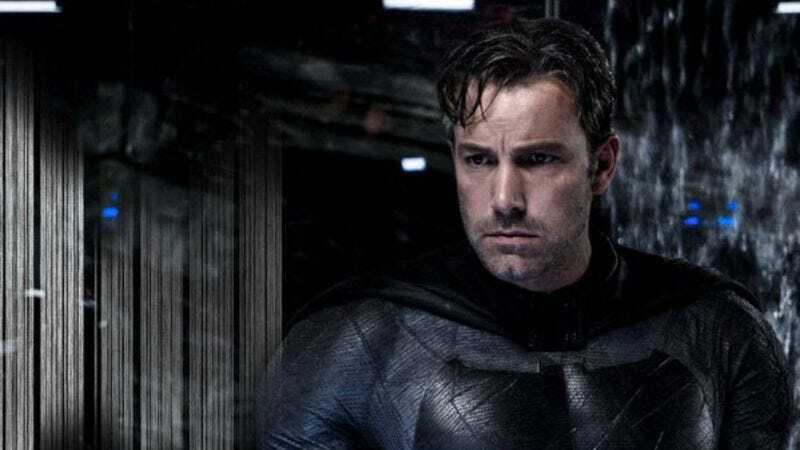 In a cover story with The Hollywood Reporter, William Morris Endeavor’s co-CEOs Ari Emanuel and Patrick Whitesell reveal that Affleck has already completed a script for a standalone Batman film. “He’s contracted to do at least Justice League One and Two, so at least three times wearing the cape,” Whitesell says, just before letting slip the news that will doubtless inspire at least one Reddit thread titled, “Why my Batman script is better than whatever Ben Affleck wrote.” Whitesell adds, “There’s a script that he’s written that is a really cool [Batman] idea, so that’s out there as an option.” This isn’t the first indication Affleck wanted a solo Batman film of his own—we reported as far back as last summer that he would be directing a standalone movie, and likely co-writing it—but this is the first we’ve heard that the multihyphenate already has a screenplay in the can, ready to shoot. So let’s assume the most likely scenario: Ben Affleck’s solo Batman outing will feature the caped crusader traveling back in time to fight himself as Christian Bale. Batman V Batman: The Dark Growl Returns, coming sometime in between Deadpool 3 and 4, probably.